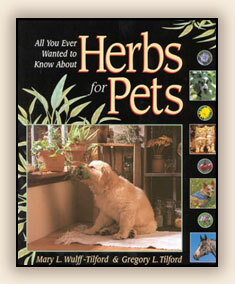 All You Ever Wanted to Know About Herbs for Pets is an indispensable resource for pet owners. Written by two of the world's most respected herbalists, this comprehensive guide contains a broad range of cutting- edge scientific information as well as traditional, historical, and philosophical perspectives on hundreds of medicinal plants and natural medicines. Turn the pages of this spectacularly illustrated book and learn all about holistic herbalism; natural nutrition; North American herbs, including Western, ayurvedic, and Chinese herbs that grow in North America; homeopathy; and how to treat diseases, ailments, and medical conditions herbally. Also included is information on identifying and growing herbs for yourself, their medicinal applications and contraindications. Valuable to the health of your pet and the environment, you will reach for this book time and time again as a resource to treating your pet the natural way. "A truly exceptional A to Z health care manual for animals. The Tilfords once again gift us with an eminently practical book that is both empowering and inspiring, a tribute to their years of experience working with animals and their mastery of herbs." Mary L. Wulff-Tilford is a professional member of the American Herbalists Guild who devotes her time and expertise to the holistic care of animals. She is internationally renowned for her work as a holistic animal care consultant and teacher. She holds certificates in Natural Therapies and Aromatherapy from the Australasian College of Herbal Studies and in Phytotherapy from the National Institute of Medical Herbalists in England, and she has a diploma in Veterinary Homeopathy (DiHom) from the British Institute of Homeopathy. Mary founded Animals' Apawthecary, a company that produces low-alcohol herbal extracts for animals. She has authored articles for several periodicals, including Natural Dog and Natural Cat, and has coauthored a book on herbal remedies for dogs and cats. Gregory L. Tilford is a well-known herbalist, author, and a formulator for Animals' Apawthecary. He is a national speaker and leading expert in the field of veterinary herbalism and serves as a consultant, writer, and custom formulator for several veterinarians, manufacturers, and publishers throughout North America. He has been a featured guest on dozens of radio talk shows, and his written work has appeared in numerous periodicals. Internationally known for his unprecedented work in the field of earth-conscious herbal medicine, Greg has written three books on the subject. He is also an accomplished nature photographer. His spectacular work has been published in several magazines and books, including this one.